A Geek Christmas Quiz–The Answers! So, now the post you’ve all been waiting for with such anticipation… the answers! G.N.U stands for GNU is Not Unix. A recursive acronym, how geeky is that? The A in ARM originally stood for ‘Acorn’ as in Acorn Risc Machine. Yes, I know it stands for ‘Advanced’ now, but the question said ‘originally’. TCP stands for Transmission Control Protocol. Paul Allen founded Microsoft with Bill Gates. I’ve just finished reading his memoirs ‘Ideas Man’. Hard work! Windows ME was based on the Balmer Peak theory of software development. The first programmer was Ada Lovelace. Yes yes, I know that’s contentious, but I made up this quiz, so there! UNIX time started in 1970 (1st January to be exact). I know this because I just had to write a System.DateTime to UNIX time converter. SGI, the mostly defunct computer maker. You get a mark for Silicon Graphics International (or Inc). Bill Gates – Co-founder of Microsoft with Paul Allen. Tim Berners-Lee – Creator of the World Wide Web. Linus Torvalds – Creator of Linux. Alan Turing – Mathematician and computer scientist. Described the Turing Machine. Helped save the free world from the Nazis. Steve Jobs – Founded Apple, NeXT and Pixar. Natalie Portman – Actress and self confessed geek. The four ‘letters’ of DNA are C, G, T and A. If you know the actual names of the nucleotides (guanine, adenine, thymine, and cytosine), give yourself a bonus point – you really are a DNA geek! The ‘c’ in E = mc2 is a constant, the speed of light. The next number in the Fibonacci sequence 1 1 2 3 5 8 is 13 (5 + 8). C8H10N402 is the chemical formula for caffeine. According to Wikipedia, Australopithecus, the early hominid, became extinct around 2 million years ago. You would not find an electron in an atomic nucleus. Nitrogen is the most common gas in the Earth’s atmosphere. The formula for Ohm’s Law is I = V/R (current = voltage / resistance). A piece of paper that, when folded in half, maintains the ratio between the length of its sides, has sides with a length ratio of 1.618, ‘the golden ratio’. Did you know that the ratio between successive Fibonacci sequence numbers also tends to the golden ratio? Maths is awesome! The closest living land mammal to the cetaceans (including whales) is the Hippopotamus. The second (and third) stage of the Apollo Saturn V moon rocket was powered by five J2 rocket engines. Saturn’s largest moon is Titan. Also the only moon in the solar system (other than our own) that a spaceship has landed on. You would experience 1/6th of the Earth’s gravity on the moon. Or there about. This question proved most contentious. The answer is false, there is nowhere in space that has no gravity. Astronauts are weightless because they are in free-fall. Gravity itself is a property of space. A Geosynchronous spaceship has an orbital period of 24 hours. So it appears to be stationary to a ground observer. The furthest planet from the sun is Neptune. Far fewer people know this, than know that Pluto used to be the furthest planet from the sun. Actually Pluto was only the furthest for part of it’s, irregular, orbit. There are currently 6 people aboard the International Space Station. According to Google (yes, I know) there are 13,000 earth satellites. Prospero was the only satellite built and launched by the UK. It was launched by stealth after the programme had been cancelled, that’s the way we do things in the UK. The second man on the moon was Buzz Aldrin. He’s never forgiven NASA. 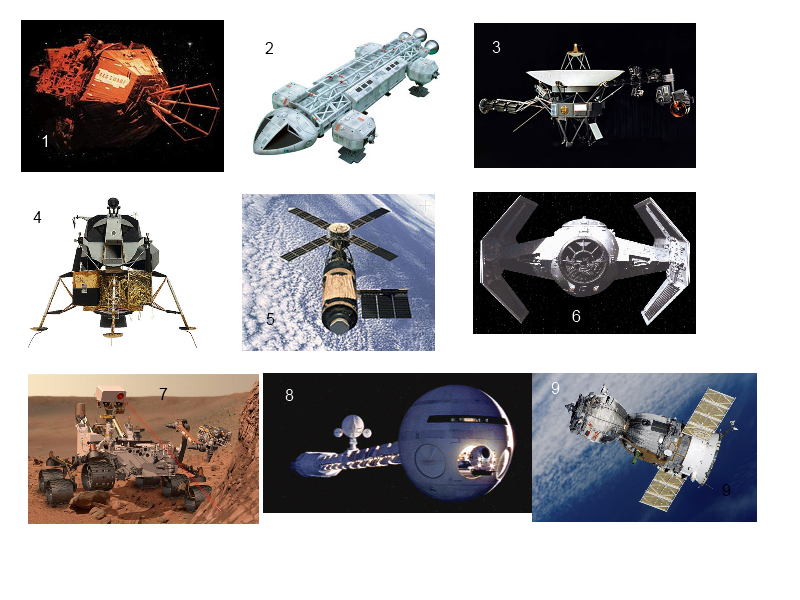 In this round, give yourself a point if you can name the film or TV series the fictional spacecraft appeared in. Red Dwarf. Sorry, you probably have to be British to get this one. Space 1999. Sorry, you really have to be British and over 40 to get this one … or a major TV space geek. Voyager. Difficult, interplanetary probes all look similar. Apollo Lunar Excursion Module (LEM). You can have a point for ‘Lunar Module’, but no, you don’t get a point for ‘Apollo’. Call yourself a geek? Skylab. The first US space station, made out of old Apollo parts. Not many people get this one. A read a whole book about it, that’s how much of a space geek I am. Darth Vader’s TIE fighter. You can have a point for ‘TIE Fighter’. You can’t have a point for ‘Star Wars’. Yes yes, I know I’m contradicting myself, but, come on, every geek should know this. Curiosity. No, no points for ‘Mars Rover’. 2001 A Space Odyssey. Even I don’t know what the ship is called. Soyuz. It’s been used by the Russians to travel into space since 1966. 46 years! It’s almost as old as me. Odd, when space travel is so synonymous with high-technology, that much of the hardware is actually ancient. ‘Spooky’ Mulder was the agent in the X-Files, played by actor David Duchovny. Kiki is the trainee witch in ‘Kiki’s Delivery Service’, one of my favourite anime movies by the outstanding Studio Ghibli. The actual quote: “Humans are a disease, a cancer of this planet.” by Agent Smith. You can have a point for Virus or Cancer too. Thanks Chris for the link and clarification. “It’s a Banana” Kryten, of Red Dwarf, learns to lie. My wife, who is Japanese, translates ‘Otaku’ as ‘geek’. Literally it means ‘you’ and is used to describe someone with obsessive interests. An appropriate question for a geek quiz I think. The name R2D2 apparently came about when Lucas heard someone ask for Reel 2 Dialog Track 2 in the abbreviated form ‘R-2-D-2’. Later it was said to stand for Second Generation Robotic Droid Series 2, you can have a point for either. African or European? From Monty Python’s Holy Grail. Open the pod bay doors please HAL. 2001 A Space Odyssey. Or on acid here. So there you are. I hope you enjoyed it, and maybe even learnt a little. I certainly did. I might even do it again next year. God rest ye merry gentlemen! Welcome to my 2012 Geek Christmas Quiz. Every Friday morning at 15below we have a ‘DevEd’ session. Usually this is a presentation about some interesting tech, or a new way we want to do something at the company, but today I thought I would try to gauge the true geekiness of our development team with a quiz. The winners, and therefore crowned top geeks, were Toby and Linda who got a total of 32 points. See if you can do better dear reader. You get one point for each correct answer. The quiz is split into six sections: Computers, ‘Name That Geek’, Science, Space, ‘Name That Spaceship’, and Geek Culture. Update: The answers are here. What does G.N.U. stand for? What did the A in ARM originally stand for? 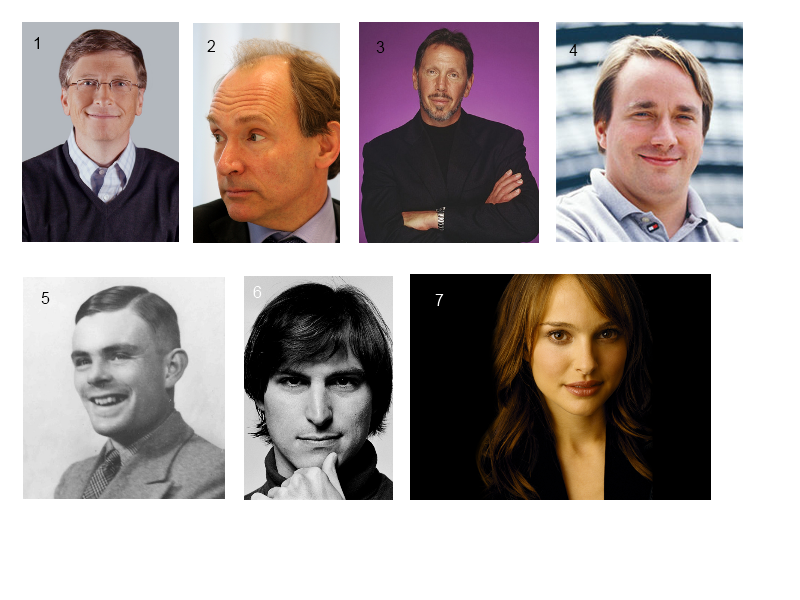 Who founded Microsoft with Bill Gates? What is F2 (hexadecimal) in decimal? Which operating system's development was based on the 'Balmer Peak'? What year does UNIX time start? What did SGI stand for? Write down the type signature of the Monadic Bind method. What are the four letters of DNA? What does the 'c' in E = mc2 stand for? What is the next number in this sequence: 1 1 2 3 5 8 _ ? What is C8 H10 N4 02 ? Write the formula for Ohm's law. If, after you fold a piece of paper in half, the ratio between its longest side and its shortest side is the same, what is that ratio? What rocket engine powered the 2nd stage of the Saturn V? What is Saturn's largest moon? What fraction of the Earth's gravity would you experience on the moon? Astronauts are weightless in space because there is no gravity. true or false? What is the orbital period of a geosynchronous satellite? How many people are currently living aboard the ISS? To the nearest thousand, how many satellites are currently orbiting the earth? What was the name of the only satellite launched by the UK? Who was the second man on the moon? Was Kiki a trainee witch or an evil princes? "It's a b... It's a b... It's a small, off-duty Czechoslovakian traffic warden!" What is it really? What does 'Otaku' (Japanese) mean? What does R2D2 stand for? What is Clarke's 3rd law? WebRequest, or rather HttpWebRequest has the annoying behaviour or throwing a WebException when the server returns 404 ‘not found’ status, or in fact any unexpected status number. It would be much better if it didn’t do this and simply allowed the application to decide what it should do on different status codes. At the very least there should be some way of turning this behaviour on or off. In fact it would be nice if the whole WebRequest class wasn’t a monolithic black box, but a toolbox of components that allowed you to tailor an HTTP client to your requirements. I was a little surprised when I did some Googling earlier and couldn’t find a nice open source alternative to WebRequest; it’s the sort of thing that the community is usually quite good at coding around. Oh well, I’ll add that to my ever growing list of potential future GitHub projects (that will never happen). It conveniently returns an HttpWebResponse instead of a WebResponse. Of course, if you want to handle the response asynchronously, you’ll have to write an extension method for EndGetResponse as well. … or, if you’re using .NET 4.5, you could use HttpClient. It wraps WebRequest internally, but it does return status codes rather than throwing it seems. I love little phrases that sum up large scale behaviours in software systems and the organisations that produce them. One of my favourite is “The Onion Of Compromise.” I first heard this gem from my excellent friend Iain Holder. Iain doesn’t claim to be the author, that honour goes to a mysterious third person named ‘Mike’. Being a programmer is all about making decisions. Lots and lots of little decisions. In fact every line of code is a decision; a little cog in the wheel of a grander machine. The simple thing that separates a good programmer from a poor programmer is that they tend to make relatively more good decisions and less bad ones. Incidentally, that’s why it’s a mistake to think that you can hire an experienced ‘chief architect’ who ‘designs’ your system, while rooms full of junior/cheap developers churn out the code - and expect anything other than a disaster to occur. The decisions are just too granular to be made by one person on a large project. Good decisions are ones which aid the evolution and stability of an application. They are summed up by epithets that describe general good practice, such as ‘Don’t Repeat Yourself’, ‘Open Closed Principle’ and a hundred others. An experienced programmer will employ a range of these rules-of-thumb to ensure that they don’t get tangled up in needless complexity as their application grows. You can tell a project where good decisions have been made; it’s easy to add new features and there are few bugs. A bad decision often doesn’t seem like a bad decision at first, merely a way of implementing a feature or fixing a bug with the least possible impact on the code. Often the bad decision will introduce a constraint on further evolution of the software or a special case given a particular combination of factors. If a bad decision isn’t rolled back it can quickly lead to further bad decisions as the programmer works around it. Soon layers of poor design wrap that initial poor decision. This is ‘The Onion of Compromise’. That initial first mistake (or compromise) leads to a cascade of poor choices. Another name for the layers of the onion is ‘Technical Debt’. It’s easy to spot software that has suffered from The Onion of Compromise; it’s brittle, you change one thing and it breaks seemingly unrelated parts of the system; it seems to take ages to implement new features; and there’s a high bug count. Any reader of this blog will know that my big project over the last year has been to create a simple .NET API for RabbitMQ called EasyNetQ. I’ve been working as a software architect at 15Below for the last year and a half. The prime motivation for writing EasyNetQ was so that our developers would have an easy API for working with RabbitMQ on .NET. I was very fortunate that, founder and technical director, John Clynes, supported my wish to build it as an open source library. I originally wrote this post for the VMWare blog as a case study of running RabbitMQ in a Microsoft environment. 15Below is based in Brighton on the south coast of England, famous for it’s Regency pavilion and Victorian pier. We provide messaging and integration services for the travel industry. Our clients include Ryanair, Qantas, JetBlue, Thomas Cook and around 30 other airline and rail customers. We send hundreds of millions of transactional notifications each year to our customer’s passengers. RabbitMQ has helped us to significantly simplify and stabilise our software. It’s one of those black boxes that you install, configure, and then really don’t have to worry about. In over a year of production we’ve found it to be extremely stable and reliable. Prior to introducing RabbitMQ our applications would use SQL Server as a queuing mechanism. Each task would be represented by a row in a workflow table. Each process in the workflow would poll the table looking for rows that matched its status, process the rows in in a batch, and then update the rows’ status field for the next process to pick up. Each step in the process would be hosted by an application service that implemented its own threading model, often using a different approach to all the other services. This created highly coupled software, with workflow steps and infrastructure concerns, such as threading and load balancing, mixed together with business logic. We also discovered that a relational database is not a natural fit for a queuing system. The contention on the workflow tables is high, with constant inserts, selects and updates causing locking issues. Deleting completed items is also problematic on highly indexed tables and we had considerable problems with continuously growing tables. I wrote about the ‘Database As Queue Anti-Pattern’ in a previous post in more detail. RabbitMQ provides a number of features that helped us overcome these problems. Firstly it is designed from the beginning as a high-performance messaging platform. It easily outperformed our SQL Server based solution with none of its locking or deletion problems. Rabbit’s event-oriented messaging model also takes away much of the need for complex multi-threaded batch processing code that was previously a cause of instability in our systems. We first introduced RabbitMQ about 18 months ago as the core infrastructure behind our Flight Status product. We wanted a high performance messaging product with a proven track record that supported common messaging patterns, such as publish/subscribe and request/response. A further requirement was that it should provide automatic work distribution and load balancing. The need to support messaging patterns ruled out simple store-and-forward queues such as MSMQ and ActiveMQ. We were very impressed by ZeroMQ, but decided that we really needed the centralised manageability of a broker based product. This left RabbitMQ. Although support for AMQP, an open messaging standard, wasn’t in our list of requirements, its implementation by RabbitMQ made us more confident that we were choosing a sustainable strategy. We are very much a Microsoft shop, so we had some initial concerns about RabbitMQ’s performance and stability on Windows. We were reassured by reading some accounts of RabbitMQ’s and indeed Erlang’s use on Windows by organisations with some very impressive load requirements. Subsequent experience has borne these reports out, and we have found RabbitMQ on Server 2008 to be rock solid. As a Microsoft shop, our development platform is .NET. Although VMWare provide an AMQP C# client, it is a low-level API, not suitable for use by more junior developers. For this reason we created our own high-level .NET API for RabbitMQ that provides simple single method access to common messaging patterns and does not require a deep knowledge of AMQP. This API is called EasyNetQ. We’ve open sourced it and, with over 3000 downloads, it is now the leading high-level API for RabbitMQ with .NET. You can find more information about it at EasyNetQ.com. We would recommend looking at it if you are a .NET shop using RabbitMQ. The green boxes are our core product systems, the blue boxes represent custom code that we write for each customer. A ‘customer saga’ is code that models a long-running business process and includes all the workflow logic for a particular customer’s flight information requirements. A ‘core product service’ is an independent service that implements a feature of our product. An example would be the service that takes flight information and combines it with a customer defined template to create an email to be sent to a passenger. Constructing services as independently deployable and runnable applications gives us great flexibility and scalability. If we need to scale up a particular component, we simply install more copies. RabbitMQ’s automatic work sharing feature means that we can do this without any reconfiguration of existing components. This architecture also makes it easy to test each application service in isolation since it’s simply a question of firing messages at the service and watching its response. In conclusion, RabbitMQ has provided a rock solid piece of infrastructure with the features to allow us to significantly reduce the architectural complexity of our systems. We can now build software for our clients faster and more reliably. It scales to higher loads than our previous relational-database based systems and is more flexible in the face of changing customer requirements. I’m using a third party library that is not thread safe, but I want my application to share work between multiple threads. How do I marshal calls between my multi-threaded code to the single threaded library? I have a single source of events on a single thread, but I want to share the work between a pool of multiple threads? I have multiple threads emitting events, but I want to consume them on a single thread? One way of doing this would be to have some shared state, a field or a property on a static class, and wrap locks around it so that multiple threads can access it safely. This is a pretty common way of trying to skin this particular cat, but it’s shot through with traps for the unwary. Also, it can hurt performance because access to the shared resource is serialized, even though the things accessing it are running in parallel. A better way is to use a BlockingCollection and have your threads communicate via message classes. BlockingCollection is a class in the new System.Collections.Concurrent namespace that arrived with .NET 4.0. It contains a ConcurrentQueue, although you can swap this for a ConcurrentStack or a ConcurrentBag if you want. You push objects in at one end and sit in a loop consuming them from the other. The (multiple) producer(s) and (multiple) consumer(s) can be running on different threads without any locks. That’s OK because the Concurrent namespace collection classes are guaranteed to be thread safe. The ‘blocking’ part of the name is there because the consuming end blocks until an object is available. Justin Etheredge has an excellent post that looks at BlockingCollection in more detail here. It just iterates 100 times creating work items and pushing them on the ventilatorQueue. BlockingCollection provides a GetConsumingEnumerable method that yields each item in turn. It blocks if there are no items on the queue. Note that I’m not worrying about shutdown patterns in this code. In production code you’d need to worry about how to close down your worker threads. Once again, this sits in an infinite foreach loop consuming items from the sinkQueue. I’ve started the sink first, then the workers and finally the producer. It doesn’t overly matter what order they start in since the queues will store any tasks the ventilator creates before the workers and the sink start. This pattern is a great way of decoupling the communication between a source and a sink, or a producer and a consumer. It also allows you to have multiple sources and multiple sinks, but primarily it’s a safe way for multiple threads to interact. The complete example is here on GitHub. Declare, list and delete exchanges, queues, bindings, users, virtual hosts and permissions. Monitor queue length, message rates globally and per channel, data rates per connection, etc. Monitor Erlang processes, file descriptors, memory use. Export / import object definitions to JSON. Wouldn’t it be cool if you could do all these management tasks from your .NET code? Well now you can. I’ve just added a new project to EasyNetQ called EasyNetQ.Management.Client. This is a .NET client-side proxy for the HTTP-based API. To give an overview of the sort of things you can do with EasyNetQ.Client.Management, have a look at this code. It first creates a new Virtual Host and a User, and gives the User permissions on the Virtual Host. Then it re-connects as the new user, creates an exchange and a queue, binds them, and publishes a message to the exchange. Finally it gets the first message from the queue and outputs it to the console. EasyNetQ is my lightweight easy-to-use .NET API for RabbitMQ. Today I added a small but very nice feature, better client properties. Now when you look at connections created by EasyNetQ you can see the machine that connected, the application and the application’s location on disk. It also gives you the date and time that EasyNetQ first connected. Very useful for debugging. Here’s an example. Check out the ‘Client Properties’ section. Today I was idly thinking about an idea I had a couple of years ago for a functional IoC container. I’d had a go at implementing such a beast, but soon got bogged down in a tangled mess of spaghetti reflection code and gave it up as too much bother. But today it suddenly occurred to me that there was no need for any reflection voodoo; the C# type system is powerful enough to do all the work for us. In object oriented programming languages we build programs from classes. Classes declare the contract(s) they support with interfaces and declare their dependencies with constructor arguments. We use an IoC container to wire instances of our classes together to make a running program. Pure functional languages, like Haskell, don’t have any concept of class, instead they use currying and partial application to compose hierarchies of functions. Here’s an example of a purely functional program written in C#. GetAndTransform simply takes an int id argument, does some work, and then returns some data. It needs a dataAccsessor and a transformer in order to do its job. In the first line, we create a new instance of our container. On the next three lines we register our functions. Unfortunately C#’s type inference isn’t powerful enough to let us do away with the tedious type annotations; we have to explicitly declare the argument and return types of each of our functions. Once our functions are registered we can ask the container for a program (main) that takes an int and returns a Data instance. The container works out that it needs to curry GetAndTransform and then partially apply DataAccsessor and Transformer to it to produce the desired function. The container turns out to be very simple, just a dictionary that’s keyed by type and contains a collection of constructor functions that know how to build the target (key) type. Rather nice, even if I say so myself. Of course this little experiment has many limitations. For a start it only understands functions in terms of Func< … >, so you can’t have more than one function of each ‘type’. You couldn’t have two Func<int,int> for example, which might be somewhat limiting. The code is on GitHub here if you want to have a play. EasyNetQ, my super simple .NET API for RabbitMQ, now (from version 0.7.2.34) supports RabbitMQ clusters without any need to deploy a load balancer. You get automatic fail-over out of the box. That’s pretty cool. If you have multiple services using EasyNetQ to connect to a RabbitMQ cluster, they will all initially connect to the first listed node in their respective connection strings. For this reason the EasyNetQ cluster support is not really suitable for load balancing high throughput systems. I would recommend that you use a dedicated hardware or software load balancer instead, if that’s what you want.